Abstract. Birds in the northern hemisphere usually increase mass reserves in response to seasonal low temperatures and shorter day length that increase foraging unpredictability and so starvation risk. In the lowland tropics, relatively low temperatures and short day lengths are absent and so the risk of starvation may be reduced, leading to much smaller seasonal effects on mass. Nevertheless, other factors such as high temperatures and water and food availability may vary greatly between tropical wet and dry seasons, leading to variable starvation risk and seasonal mass effects. Using data collected from 47 species of birds caught over a 10-year period in a tropical savannah region in West Africa we tested for seasonal variation in mass in response to a predictable, strongly seasonal tropical climate. Many species (91%) showed seasonal variation in mass, and this was often in a clear annual pattern that was constant across the years. Many species (89%) varied their mass in response to seasonally predictable rainfall. Annual variation in mass was also important (45% of species). Relatively few species (13%) had a seasonal pattern of mass variation that varied between years. Feeding guild or migratory status was not found to affect seasonal or annual mass variation. Seasonal mass change was on average 8.1% across the 21 species with a very large sample size and was comparable with both northern and southern temperate species. Our study showed that biologically significant consistent seasonal mass variation is common in tropical savannah bird species, and this is most likely in response to changing resource availability brought about by seasonal rainfall and the interrupted foraging response due to the constraints of breeding. The weavers included in this study were: Speckle-fronted Weaver Sporopipes frontalis, Little Weaver Ploceus luteolus, Vitelline Masked Weaver Ploceus vitellinus, Heuglin's Masked Weaver Ploceus heuglini, Village Weaver Ploceus cucullatus, Black-necked Weaver Ploceus nigricollis, Black-winged Bishop Euplectes hordeaceus, and Northern Red Bishop Euplectes franciscanus. 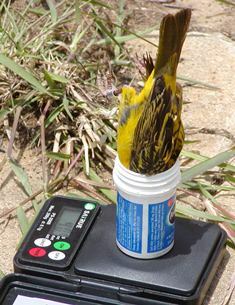 Photo: weighing a Village Weaver in Mpumulanga. The birds in the above study were weighed on electronic scales, including Village Weavers (of a different race to the one shown here).